The HP iPAQ 6340 is HP's first truly integrated Smartphone. The iPAQ range is one of the most popular brands of PDA in the world, and you can see why when you look at the iPAQ 6340. It's much more than just a standard PDA - the iPAQ 6340 has quad-band GSM, GPRS, infra-red, WiFi and Bluetooth built in, enabling you to easily make calls, surf the web and communicate with PCs and other devices. Like most iPAQs, the 6340 has a large touch-sensitive 240x320 pixel transflective display, measuring 3.5 inches. Overall the iPAQ 6340 is compact for a PDA, measuring 138x75x21mm and weighing 190 grams. There's 64Mb of memory built in the the HP iPAQ 6340, and this can be expanded using SD memory cards. There's no camera on the 6340 - although you can order the HP iPAQ 6365 on import if you want that. 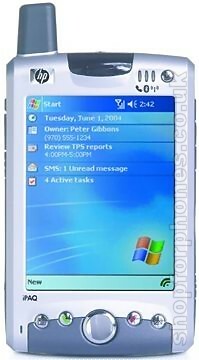 The iPAQ 6340 runs Microsoft Windows Mobile 2003 for Pocket PC Phone Edition and comes with Pocket versions of Internet Explorer, Word, Excel, Windows Media Player (for videos, MP3 and audio files) and other accessories and applications. Certainly one of the most impressive PDA/phones to date, the HP iPAQ 6340 is bound to be on the wish list of many power users! Available SIM Free for UK delivery. If you want more information on the HP iPAQ 6340, subscribe to our mailing list. Also, the Update newsletter contains general news about new phone releases.